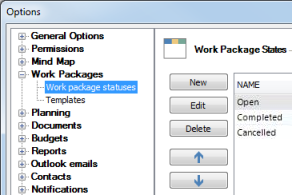 The status defines different work package states. You can find the work package status in the project, on the Work Packages page, in the Edit group, on the Edit tab. Open the dialog box InLoox PM Options. For more information on how to open the InLoox PM options, please see Open the InLoox PM options. Create a new status by clicking New. In the Edit Work Package Status dialog box, enter a name anddefine the color in the Flag field. Edit the existing status. Choose one status from the list and click Edit. Remove the selected work package status from InLoox PM by clicking Delete. You can change the status position in the list. Click Up to move it upwards or Down to move it downwards in the list. Click OK or Apply to save the changes in InLoox PM. The sequence of this list corresponds to the sequence displayed in the projects, on the Work Packages page. Adding a new status has no effect on existing projects. The new status is visible in the whole system. Changing the sequence of states has no effect on existing projects. Changes to the state (e.g. name, color) take immediate effect in all relevant projects. Deleting a state causes all projects using it to remain without state until the user makes a manual correction. How to edit the status of a work package | InLoox PM 8 • Copyright 1999-2019 © InLoox, Inc. All rights reserved.